At first glance, the basis of Lee Hall's play seems a simple one - a feel good tale about a group of miners in the 30's discovering they have a talent for painting. Before seeing it, I'd wondered where exactly the 'drama' or 'meaning' was going to come from. I'm not sure I've ever been more wrong. Two days later I'm still struggling to crystallise my feelings about the issues faced by the characters and the questions asked about our society - both then and now. The play is filled with clashes of values and ideas - the individual v the collective; price v value; patronage v patronise; and whilst the focus is on art, the arguments apply across many aspects of society. Although at times in the second act it can get a little wordy, things never feel forced or heavy handed. As Hall has his characters learn, the message in art (and in theatre) reveals itself through the a combination of the creator, the object and the observer. This is very much a play that rewards thought and reflection. The waters are also muddied by a shifting balance of power between characters, and motivations that are often left ambiguous. Of course, many of the themes of the play have a particular resonance for us - particularly Oliver Kilbourn's repeated pleas to be told if he was truly gifted as an artist or just 'good for a miner'. Despite a stringent policy at View From The Stalls of holding all productions to professional standards it's an issue we are very aware of when commenting on amateur or youth theatre. Almost the definition of an ensemble piece, the entire cast deliver impressive performances, but Trevor Fox as Kilbourn deserves a special mention for the subtlety he brings to the character in his later scenes with Lyon. Max Roberts' direction is simple but hugely effective at evoking time and place; his use of projected images allowing the audience to see the paintings 'up close'. The gentle banter makes for an entertaining evening, but it's the quiet thoughtfulness of the play that will stay with me. 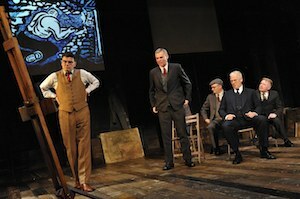 "The Pitmen Painters" runs at the Theatre Royal, Glasgow until Saturday 30th July and then continues on a national tour. Image by Keith Pattison used with permission.